The Mafia, also referred to as La Cosa Nostra (Italian for This Thing Of Ours or Our Thing), is the collective name of numerous secret organizations in Sicily and the United States. A member of the Mafia is a "Mafioso", or a "Man of Honor". The Mafia was originally the name of a loose confederation of people in Sicily, who, in the Middle Ages, joined for protection from the Turks and Normans occupying the area. 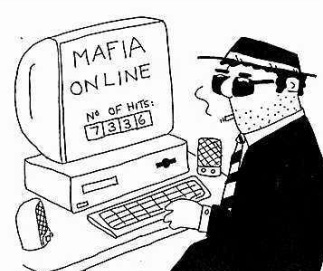 (In fact, the word "mafia" comes from an Arabic word for "refuge".) Soon, this group turned to vigilante law enforcement and organized crime. 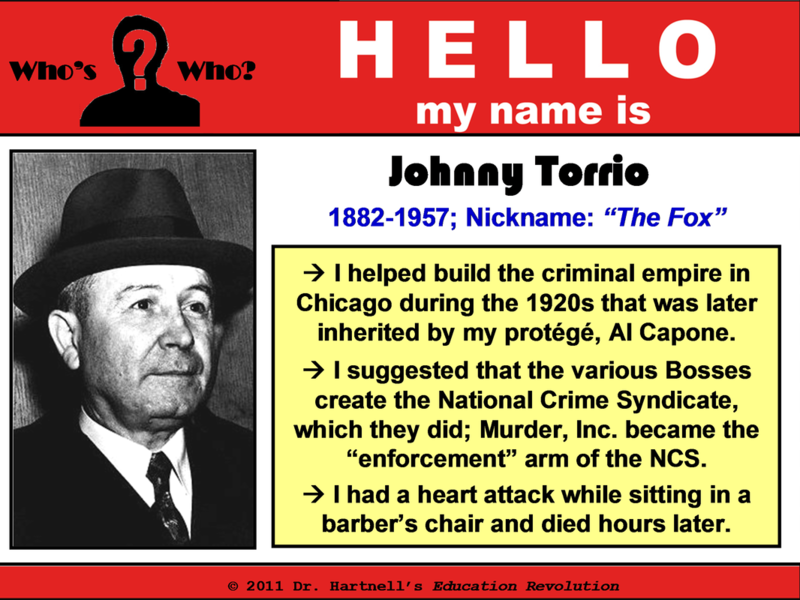 By the 20th Century, the Mafia came to the U.S. through immigration and joined forces with American organized crime to capitalize off of bootlegging during Prohibition. Mafia power peaked in the U.S. in the mid-20th Century when a series of FBI investigations began curtailing the Mafia's influence. 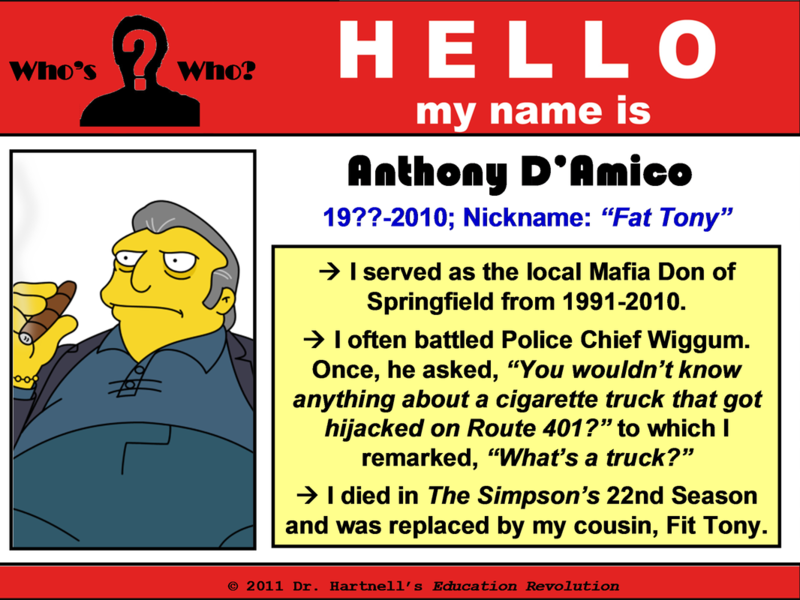 Despite the decline, the Mafia has become entrenched in American popular culture where it has been romanticized and portrayed in movies, TV shows, and even product commercials. The Mafia first developed in Sicily in feudal times to protect the estates of landlords who had gone off to war. By the last half of the 19th Century, just as the unification of Italy was being achieved, the Mafia had become a network of criminal bands that dominated the Sicilian countryside. The Mafia emerged from an area of Sicily where the wealth was concentrated and made good money in the orange and lemon export business. Partnerships and protection rackets between the Mafia and the landowners were common. 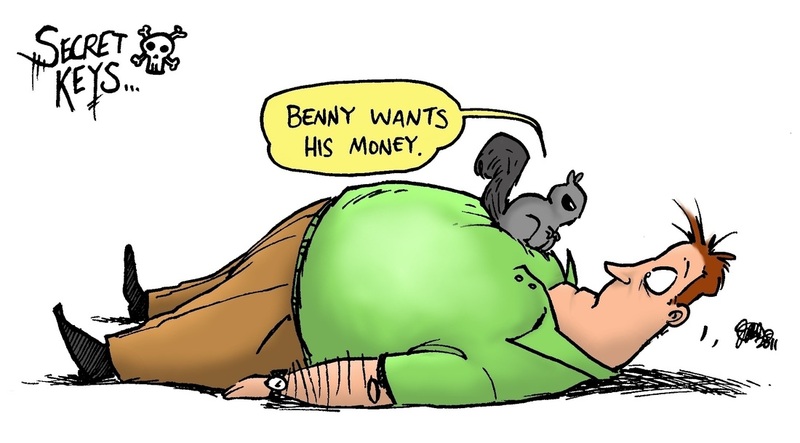 The Mafia needed the landowners... and the landowners needed the Mafia. 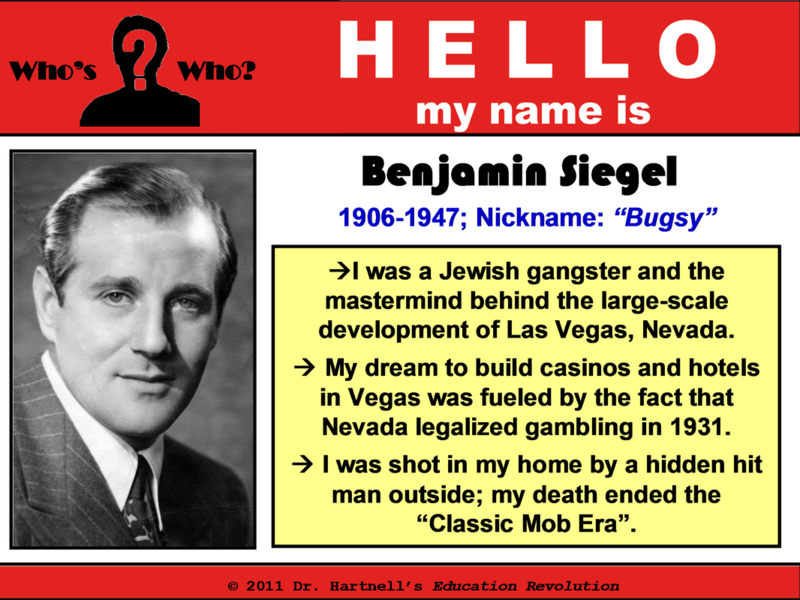 Sicilian immigrants brought the Mafia with them to the U.S. in the late 1800s and early 1900s. 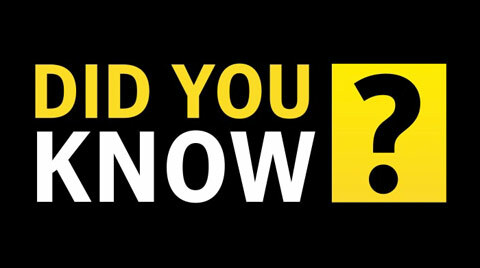 Newly arrived Italian immigrants often spoke no English and settled in the same districts of American cities as other Italians. Many Americans were suspicious and mistrustful of recent immigrants, especially those with a limited command of English. Some Italians felt that they could not rely on the often corrupt and prejudiced local law-enforcement officials for protection... and turned to the Mafiosi instead. Mafia groups in the U.S. soon became entrenched in American organized crime, especially in the 1920s during Prohibition. After the repeal of Prohibition in 1933 ended most bootlegging, the Mafia moved into other areas, such as gambling, labor racketeering, prostitution, and narcotics. The Mafia first became influential in New York City, gradually progressing from small neighborhood operations to citywide and even international organizations. 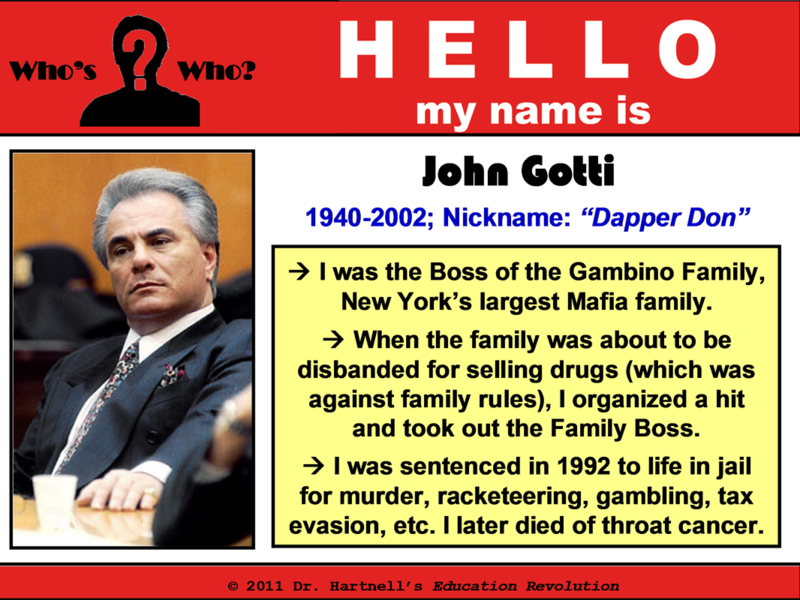 Five families dominated, each named for prominent members: the Bonanno Family, the Profaci/Colombo Family, the Gambino Family, the Luciano/Genovese Family, and the Lucchese Family. Each family was ultimately controlled by a Don, who was insulated from actual operations by several layers of authority. According to popular belief, the Don's closest and most trusted advisor was referred to as the consigliere ("counselor" in Italian). 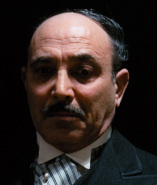 In reality, the consigliere was meant to be something of a "hearing officer" who was charged with mediating intra-family disputes. An underboss was possible as well. There were then a number of regimes with a varying number of soldiers who conducted actual operations. Each regime was headed by a caporegime that reported to the boss. When the boss made a decision, he never issued orders directly to the soldiers who would carry them out, but instead passed instructions downthrough the chain of command. In this way, the higher levels of the organization were effectively insulated from incrimination if a lower level member should be captured by law enforcement. This structure was immortalized in the novel and movie The Godfather. Initiation rituals were secret and passed down via oral tradition, though they are rumored to involve burning a card with the picture of a Saint on it and tossing the flaming pieces from hand to hand. Members initiated into this organization were referred to as made men and were under the protection of their family. 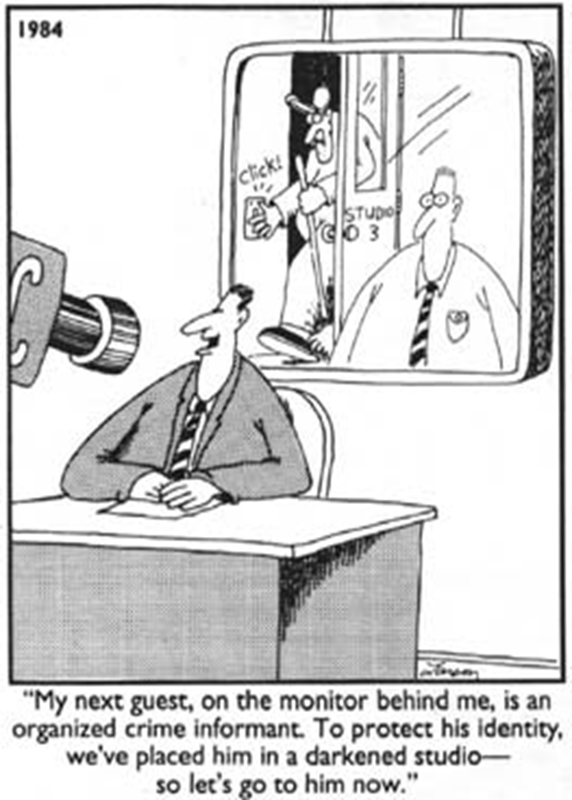 A hit (assassination) of a made man had to be "pre-approved" by the leadership of his family, otherwise retaliatory hits would be made, possibly inciting a war. 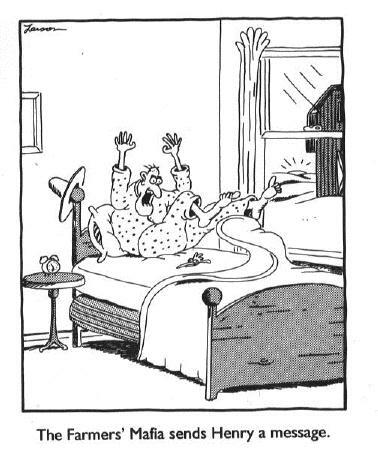 In a state of war, families would "go to the mattresses". This entailed renting vacant apartments and having a number of soldiers sleeping on mattresses in shiftswhile the others were ready at the windows to fire at members of the rival families. In Italy in particular, there has been a long history of police prosecutors and judges being murdered by the Mafia in an attempt to discourage vigorous policing. 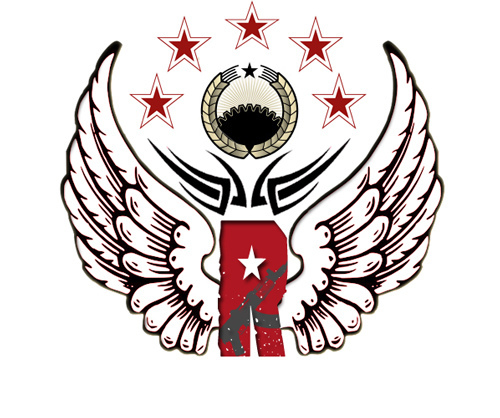 In the U.S., the Mafia began a steep decline in the late-1970s and early 1980s due in part to laws such as the Racketeer Influenced and Corrupt Organizations Act (or RICO Act), which made it a crime to belong to an organization that performed illegal acts. On a whole, however, there was a gradual disbanding of the Italian-American community through death, intermarriage, lack of continued Italian immigration, and cultural assimilation. 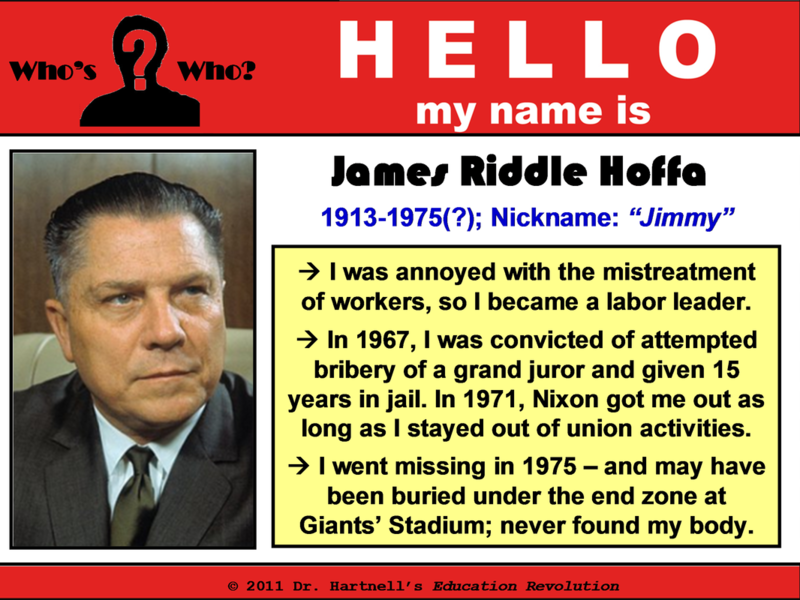 In the 1950s, the Mafia was reputed to have infiltrated many labor unions in the U.S., including the Teamsters whose president James "Jimmy" Hoffa (1913-1975?) "disappeared" and may have been killed by the Mafia. 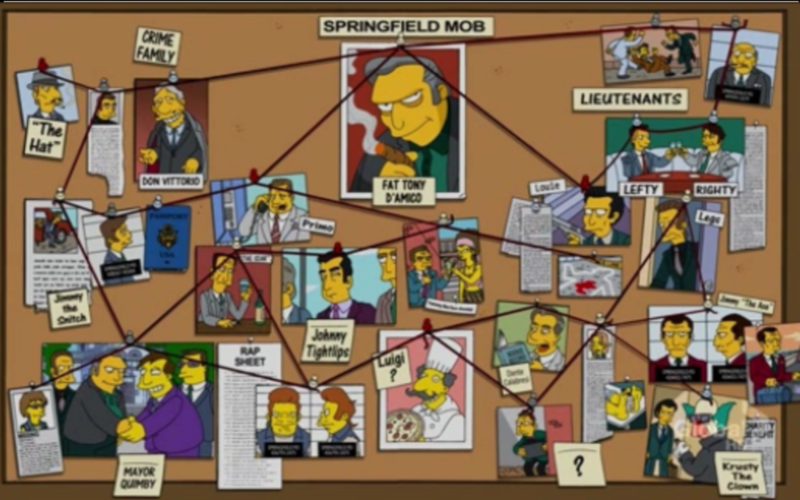 In the 1980s, the U.S. Government attempted to remove Mafia influence from labor unions. In Italy, there is some evidence that law enforcement seems to be finally gaining the upper hand over the Mafia organizations because of stronger laws and the breaking down of the "code of silence". A huge help in fighting the military side of Mafia has been provided by many so-called pentiti (Mafia members who dissociate or become "informants"in exchange for a milder judicial treatment). to any large group of people engaged in organized crime (like the Russian Mafia or the Japanese Yakuza), or in suspicious activity (such as the Trenchcoat Mafia that was incorrectly linked to the 1999 shooting at Columbine High School). Still, most people associate the term "Mafia" with its Sicilian origins. 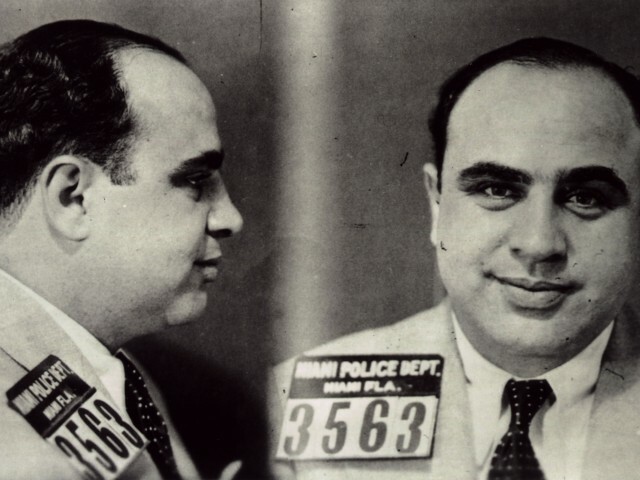 Al Capone got his nickname "Scarface" after a bar brawl in Coney Island that left him with 3 large slashes on his face. Thanks to bootlegging, he was worth $100 million in 1920 (which is $1.1 billion today). 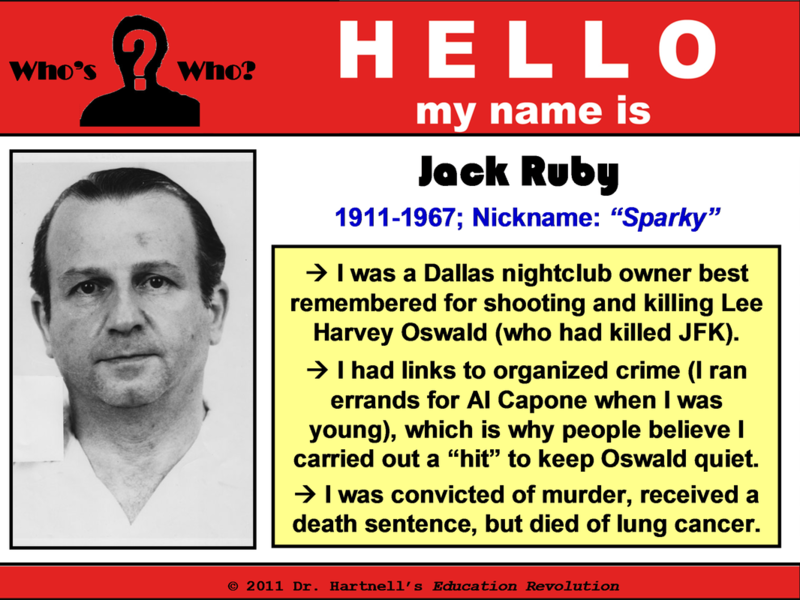 His downfall occurred when he was convicted for income tax evasion and sent to Alcatraz. He was released after 7 years and died from syphilis in Miami Beach, Florida in 1947. 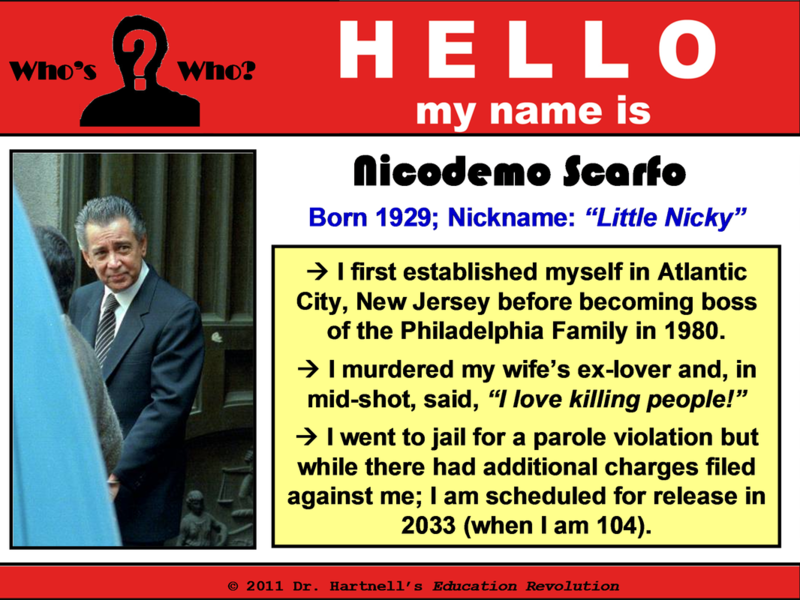 However, when many Americans hear the name "Scarface", they think of the 1983 movie by the same name. The movie Scarface details the rise and fall of Cuban immigrant Antonio "Tony" Montana, a fictional character played by Al Pacino. Tony Montana has become a cultural icon and is one of the most famous movie characters of all time, embodying the rise from the bottom to the top... even if his success was from the world of narcotics. 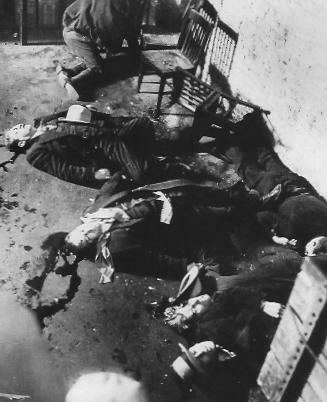 On the morning of Thursday, February 14, 1929, five members of George "Bugs" Moran's North Side Gang, plus two gang collaborators, were lined up against the wall of a garage in the Lincoln Park neighborhood of Chicago, and executed. Two of the shooters were dressed as police officers, while the other shooters wore suits and ties. To give the appearance that things were under control, the men in street clothes came out with their hands up, prodded by the two uniformed "cops". 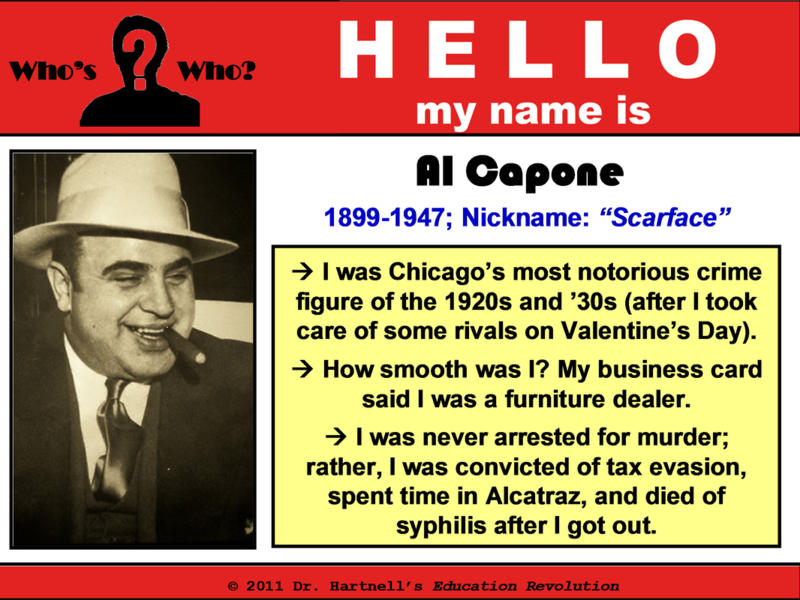 The hit was organized by rival gangster Al Capone. Moran's muscling in on a Capone-run dog track in the suburbs, his takeover of several Capone-owned saloons, and the rivalry for control of the lucrative bootlegging business were contributing factors to this incident. 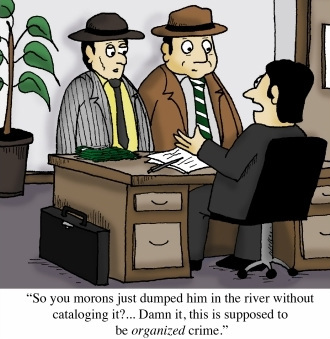 The plan was to lure Moran to the warehouse with the promise of a stolen, cut-rate shipment of whiskey. On Valentine's Day, members of the Moran gang arrived at the warehouse, but Moran had left his apartment late and was not there. As he approached, he saw the "police" car pull up. He turned around and went to a coffee shop. 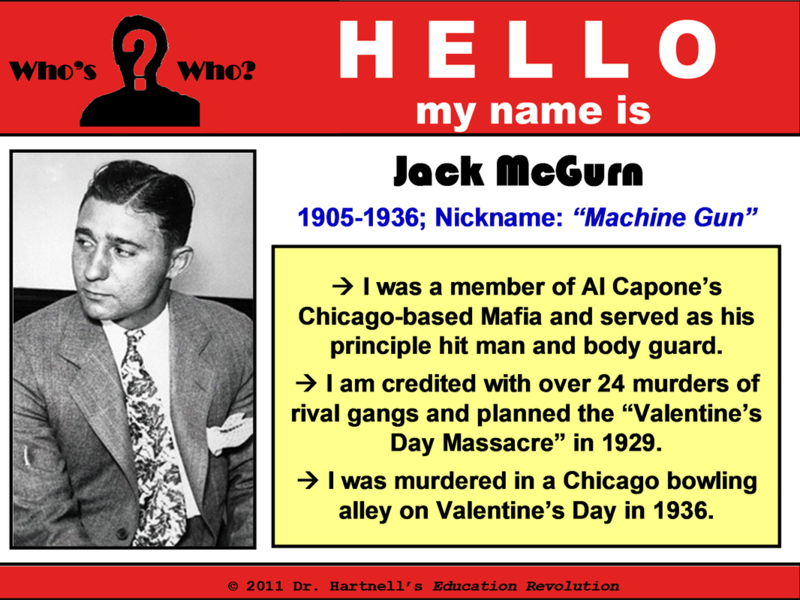 Public outrage over "The St. Valentine's Day Massacre" marked the beginning of the end to Capone's influence in Chicago. 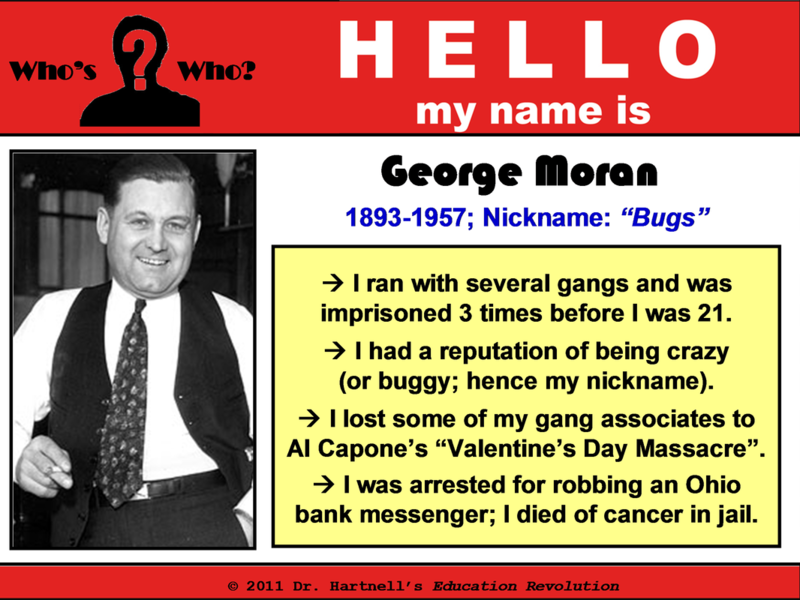 Although Moran suffered a heavy blow, he still managed to keep control of his territory until the early 1930s, when control passed to the Chicago Outfit under Frank Nitti, who had taken over the Capone organization after Capone's conviction for income tax evasion. the most representative member of a family. impact on the public. Shooting began on March 29, 1971 and was completed on August 6, 1971. 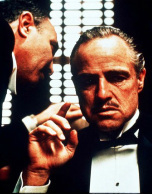 The producers of the movie did not believe The Godfather would be very successful; hence, there was an extremely low budget for the film. Interestingly, this obliged the crew to use regular lights, instead of the production/set lights, lending a realistic look to the film. the highest-grossing film of all time (until that record was surpassed by Jaws in 1975... and a number of other movies after that). "I believe in America. America has made my fortune. And I raised my daughter in the American fashion. I gave her freedom, but I taught her never to dishonor her family. She found a boyfriend; not an Italian. She went to the movies with him; she stayed out late. I didn't protest. Two months ago, he took her for a drive, with another boyfriend. They made her drink whiskey. And then they tried to take advantage of her. She resisted. She kept her honor. So they beat her, like an animal. When I went to the hospital, her nose was a'broken. Her jaw was a'shattered, held together by wire. She couldn't even weep because of the pain. But I wept. Why did I weep? She was the light of my life beautiful girl. Now she will never be beautiful again. I went to the police, like a good American. These two boys were brought to trial. The judge sentenced them to three years in prison – suspended sentence. Suspended sentence! They went free that very day! I stood in the courtroom like a fool. And those two bastards, they smiled at me. Then I said to my wife, for justice, we must go to Don Corleone." -- Amerigo Bonasera, in speaking with Don Corleone on the day of his daughter's wedding. Click here to view this opening clip from The Godfather.